Many young professionals under the age of 40 are taking leadership roles in the auto industry and impacting the remarketing and used-car business. In Year 2 of Auto Remarketing’s annual Remarketing & Used-Car Industry's 40 Under 40, we bring you their stories and the paths to success they forged at such young ages. In this special section of the Sept. 1 issue, you will find the current and next-generation leaders of the business who are making big differences in the industry and at their companies. And be sure you don’t miss the special ceremony at Used Car Week to recognize this year’s group of honorees. More on that can be found at www.usedcarweek.biz. 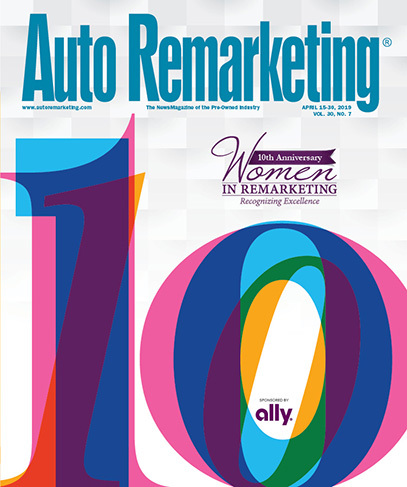 Auto Remarketing would also like to thank everyone for nominating dozens and dozens of outstanding leaders. This group represents just a fraction of the incredible young leaders this industry has to offer. Jennifer Nelson, Patrick K. Wills Co.
Jeannie Warzynski, Automotive Finance Corp.